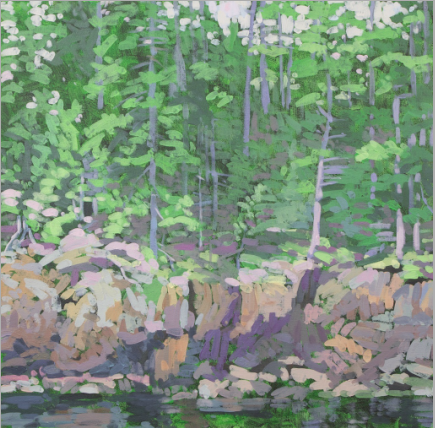 On view at Pascal Hall in Rockport for the month of August will be the work of three painters who visually explore the natural environment of Maine in various ways. Stammen’s oil paintings capture her physical exploration of the landscape around her. Warner finds contemplative moments in nature and expands them into large-scale, acrylic meditations. 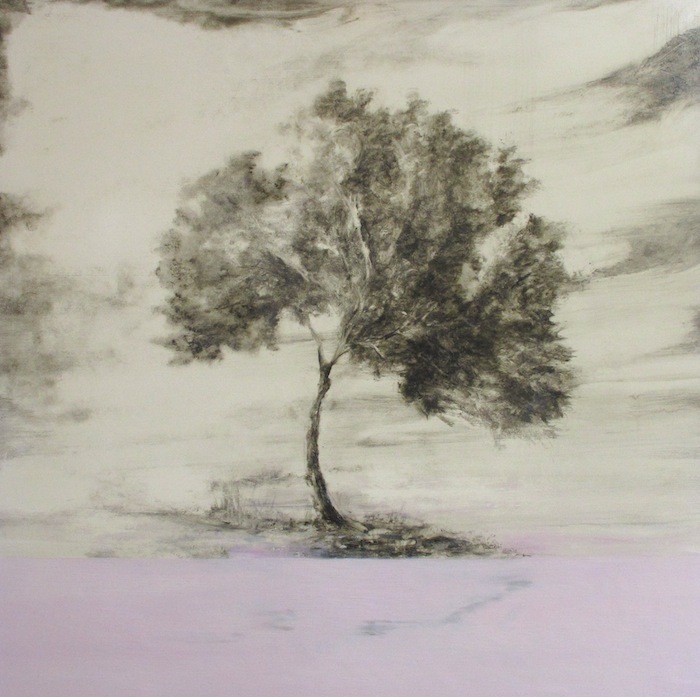 Williams’ paintings on mylar are singular works of imagination, simultaneously exploring the interior and exterior landscape of islands and trees. Jessica Stammen returned to live and work in the midcoast after graduating from The Cooper Union School of Art and NYU. 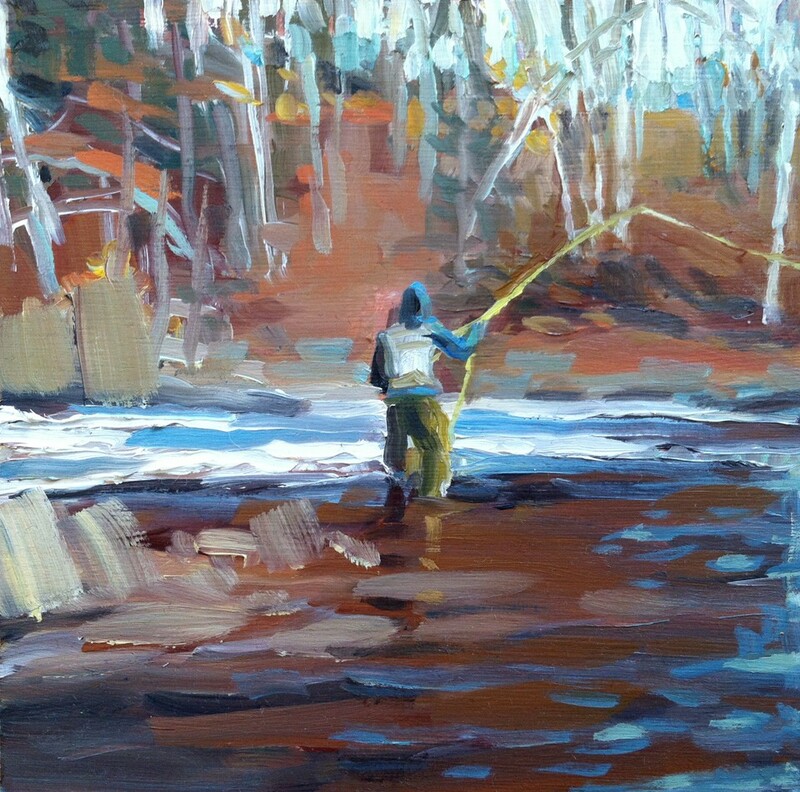 Her most recent oil paintings portray people adventuring in the landscape. Her “outsiders” swim, climb, paddle, surf, and play with edges between portrait and landscape. “Humans have a deep need for play,” she writes. “My paintings are my work, but my work flows from this deep need. The painter Lapicque demanded that the creative act of painting should offer him as much surprise as life itself. 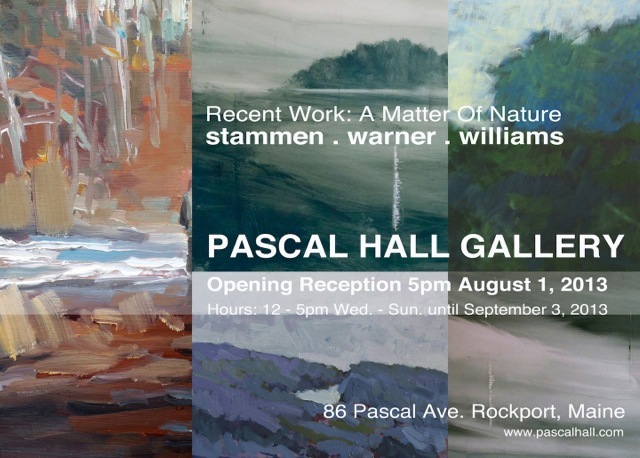 I demand the same, with the added desire that my paintings re-create the joy of deep play or recreation, even if for a moment, in viewers.” At Pascal Hall some of Stammen’s earlier window paintings will also be on display. Seeing leads to doing. This artist looked out windows long enough and finally decided to walk — and climb and paddle and play — outside. Susan Williams, born and raised in New York City, has painted imaginary landscapes since childhood. She received her BA from Bowdoin College but it wasn’t until, decades later, compelled by her fondness for the piney and rocky coast of Maine, she and husband, Rufus, and their two children moved to the coastal village of Rockport. Susan’s studio is a work of art in itself. Set in a barn a little bit away from her grey shingled home, the light streams in over the empty floor encircled by her mystical trees. For many wonderful years, Susan was the creative director of Swans Island Blankets, collaborating on projects with J. Crew and Levi’s, and recently decided to spend more time painting. Her work has been exhibited throughout the United States. “A Matter Of Nature: Stammen, Warner, Williams” will be on view from August 1st through September 3rd. An opening reception will take place on Thursday, August 1st from 5-7pm. Pascal Hall is an elegant and sophisticated event space overlooking the harbor in Rockport. Housed in the former sanctuary of the Rockport Baptist Church, circa 1850, Pascal Hall was recently and meticulously renovated as a New York style art gallery. For several years it housed Elan Fine Art, one of the more prominent art galleries along the mid-coast. Pascal Hall is located at 86 Pascal Avenue and is open 12-5pm, Wednesday through Friday during the duration of the show. For more information about this exhibition please send an email to info@PascalHall.com.